This has been the best, most memorable baseball season of my entire life. I’ve always been a Chicago Cubs fan, and I come from a long line of Cubs fans. This win was HUGE. And it’s not just about the win. There’s also the love of good baseball, all the memories that come flooding back, and the camaraderie of belonging to a group of fans. We lived in San Francisco for all three of their World Series wins, and that was magical and wonderful, and I loved seeing the city so upbeat and celebratory. But it was different. The Cubs were still my team. Year after year, we told ourselves, “There’s always next year.” I usually got bored with them by July, knowing the season was not going anywhere. This season, they had more wins than any other MLB team. They were on fire. I knew they’d go far, maybe even make it to the World Series. And when they made it there, that was enough for me. But the win. YOU GUYS. So huge, so wonderful, I couldn’t wipe the smile off my face for 2 days. I have so many great memories of watching games with my Dad. I’ve only gotten to be at Wrigley for a game once, and I got to see Sammy Sosa hit a home run. I had the awkward pleasure of wearing my Cubs gear and going to a game in San Francisco when the Cubs were in town. It was especially awkward, but totally worth it, when the Cubs would win in San Francisco. I’ve also know some incredibly dedicated and faithful fans who have passed away and did not get to see this win, at least not from our vantage point. I hope that wherever they are, they know that it finally happened, and I hope they’re celebrating accordingly. I’m super jealous of my relatives who got to attend the parade, I bet that was so fun. Here’s to my meager 37 years of hoping and wishing, compared to some people who have waited many more years. It was worth the wait, and even more joyous and amazing than I could ever have dreamed it would be. Go Cubs! Hugs, Chicago! 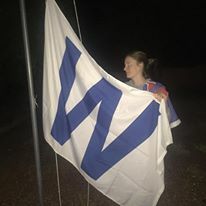 Fly that W! Next Next post: Writer’s Block. Or Maybe Not.